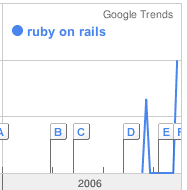 A fellow Ruby enthusiast was commenting on trends in Ruby on Rails popularity, prompting me to revisit my own article on a similar topic. I was shocked to discover that since just two weeks ago, Google Trends has noticeably altered search history information! 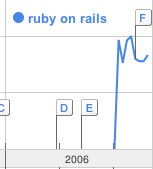 Both search pattens now appear to have spiked about 4 months later than before, with a significant change in Ruby on Rails’ graph shape. Does Google have some secret agenda? Probably not, after all – Google Trends are still listed under Labs, meaning perpetual Beta. Google Trends aims to provide insights into broad search patterns. As a Google Labs product, it is still in the early stages of development. Also, it is based upon just a portion of our searches, and several approximations are used when computing your results. Please keep this in mind when using it. Approximations and guesses are fairly consistent for popular search results, as deviations are normalized over large numbers. 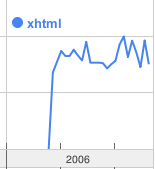 Not so for low volume search queries. 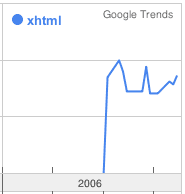 This is actually another problem with Google Trends – there are no absolute numbers shown, just a shape of the graph. Having the data normalized to itself will display a clear trend – up, down, or sideways, but there is no perception of the scale involved. 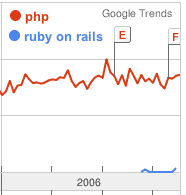 This is just one small piece of whole information, kind of how the nearly vertical spikes of Ruby’s popularity in India are just dots in comparision to PHP (which in turn represents a fraction of Java searches). So no, Google has not invented a time machine, nor are they pretending to have one. Though this example does illustrate the point that data and patterns within need to be put into a perspective on a larger scale than itself, to more accuratly demonstrate the trends involved. Thanks for the deeper analysis Tony. Today Google Trend is probably less more than a fanny game. Anyway, it still gives some interesting discussion elements.